The Eyeball is On… Reservations Start Tuesday at 12noon. Lunch at the new Zubuchon outlet on at the One Mango Complex, Mango Avenue (more details of venue as soon as I get the formal address) Lunch will be in two shifts so as not to overwhelm the kitchen… Registered guests will receive a 30% discount on their lunch meal that day. I will put a post up at NOON on Tuesday, June 7, 2011 and the first 40 people who sign up will be on the list. Please do NOT sign up if you are “iffy” as that would take away spaces from others who might like to attend the event. Mayflower Inn – Right near the provincial capitol building. I have not stayed there, but visitors to the last eyeball found this to be good value as well. Rooms for doubles range from PHP1,200 or so. Radisson Blu – the 4 star feeling like 5 star hotel beside the SM mall which is 10-15 minutes away from the Zubuchon venues. Marketman can get you preferential corporate rates here if you would like, some PHP4,600-5,000 per room per night. You may also want to look into the Marriott Hotel or Marco Polo Hotel at the top end of places to stay. That looks sooo good, whatever it is. Suka and toyo with sili plus steaming white rice! i am still considering sir. my present religious state won’t allow me to join but i would be missing a lot. would there be veggies sans pork? anything without a hint of pork i mean? At first I thought lechon kawali, but one of the bones is thin, more like that of chicken than pig. Are we playing with best chicken ever!!? Looks yummy! 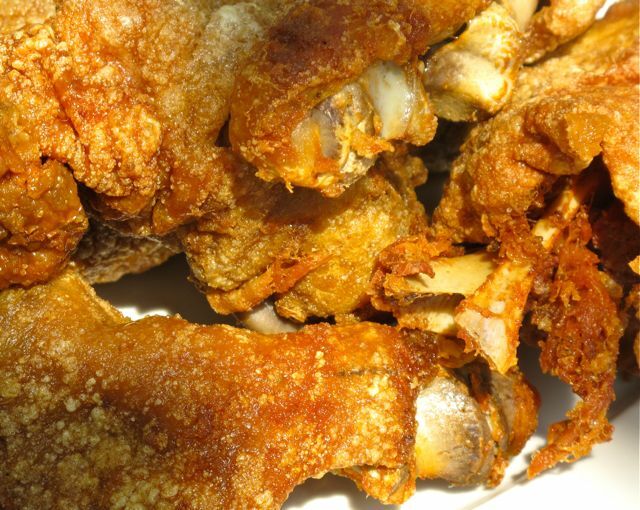 It looks like the best ever crispy pata of Zubuchon. Bring it on MM! Hi MM, is it possible if ill just attend the lunch at zubuchon mango ave? That dish sure have some serious yummy crunch on it! I will patiently wait for your restaurant opening in Manila :-). I wish that both your Cebu restaurants will be hugely successful so that my waiting will not be so long. Hmm, that looks like crispy pata. Acupunctured crispy pata? MM, looks very delicious, but should not be frequent :) Else, mapapa-aga ang homecoming to heaven. Business is growing MM, congrats and keep reinventing and innovating the classics! Hi MM. I hope I can make it to your reservation list tomorrow. I am still on travel. That acupuncture-d crispy pata-like dish is going down my gullet! turbo broilered zubuchon, i’m fairly sure! OH , why 12n??? huhuhu, we don;t have a computer in the clinic… i have to cancel appointments. C ya! hello MM, could i still make a donation to the charity even if i do not make it to the eyeball? …not a pork eater, but that’s crispy pata, isn’t it? Re: the picture, my guess would be a zubuchon piglet deep fried in quality lard for that vein-clogging goodness! I’m all set for this. Plane tickets confirmed. Hotel Booking confirmed. meeting up with friends– booked. now just waiting for the email confirmation from MM. i know the venue, i just wish i could go, ive been following your blog and its my honor to meet you face to face MM, Mrs. MM, and The Teen. dont forget to post the pics..
I’m sorry not to be able to make it, MM. Will be overseas by then. Whee! I hope I made it on the list in time. Excited!! For the out of towners, MM’s hotel recommendations are great. Casa Escano is cheap and the rooms are huge. OMG does it come with the triple bypass surgery that you’re sure to need after ingesting one order of that? Was going to post something nasty, like I HATE THIS BLOG! especially that I cannot make it to the June Eyeball ( hi betty Q: we’ll just have to catch another one when you come and visit and we’ll fly to Cebu), but that picture above of crispy accupunctured goodness really got me yesterday. Having shied away from pork , I could not resist the pork shoulder with a small island of skin staring at me at the grocery meat section. At home, I seasoned it porchetta style, punctured the skin a hundred times with roasting pins and stuck the roast in the oven. A couple of hours later I was munching on the crispy puffed skin all by myself, imagining I could be dining at MM’s Table, but…. decided to leave a small piece for hubby after all. Surprisingly, the skin kept its crispness even hours later. Wish I could have more, but surely one day……in Cebu. K bettyQ? Looks as though it’s ready to snap, crackle and pop soon as it touches your lips. On top of the sumptuous feast, meeting a passel of posters to Market Manila would be a real treat for any fan. Finally matching a physical presence to a disembodied voice or vice versa, I am sure, would be truly revelatory. It must be what it was like for silent movie fans having to cope with the arrival of the talkies or like the owner of a stolen horse who posted a reward for finding it and receiving too many impostors, just had to make sure it was the right horse by fitting its pace to the right mane. Let me see, I was a helper in my sister’s meat stall in Guadalupe for 2 years.. if I am not mistaken that could not be pork pata…even with the picture enlarge the bones are different. These are either a turkey or duck or chicken wings cooked like Zubuchon. Owww.. I hope I am right. I am experimenting on pricking some pre-boiled pork pata this weekend, dry it in the sun then broil/bake later. Ummm… gutom na ako. Your invite to visit Palawan, Ms. Connie C., I cannot refuse…the way you described the way of life, is certainly the ideal retirement place. One of my brother-in-law’s sisters just bought a place in Cebu to retire…..mine will be Palawan! Talk about the pins …I think it was Adam Liaw’s blog that I saw that pig sticking pins? that looks like a brush with deadly pins sticking out and could be made in China…so, Cumin, if you happen to see it there, please let us know…or maybe available as well in Singapore. Ms. Connie C and Ebbablue…ebay has Jaccard meat tenderizer that could be used to prick the pork skin in no time at all…looks like a comb with roasting pins! betty q., I would do anything for my kitchen goddess, but unfortunately I’m not in China (even if the computer says so), I’m in QC. I did live in China for several months, but I don’t remember seeing the pig sticking pins you describe — but aren’t the produce in open air markets there simply gorgeous? Hey Betty Q, do not be too rash on settling for your retirement in Palawan. I heard frogs from there jump and aim for targets that can make you scream and call the attention of neighbors for miles around. I have a Jacquard meat tenderizer given to me as a present but I have never used it since I do most of my carnivorizing abroad. I use precut pork belly or fresh hocks from our Chinatown here when I crave crunchy pork so there has not been any occasion to use it. It has sharp 1/8” blades that automatically retract so I think it can punch a pig’s hide quite efficiently. Ah, Footloose, you remember again! bettyQ: do not listen to Footloose, you just have to make sure the froggies are not sitting in or on the john. Sorry MM, here we go again. There are snapping turtles and snapping frogs.. that is real true…BettyQ, you know naman sa Pinas, they can improvise anything.. so baka ang ipagawa ko sa bayaw ko, take out the bristles on my hair brush, tapos mag-pukpok siya ng small pako that will penetrate the other sides exposing the sharp ends…tapos ayun, murang-murang klase ng roasting pins… oh diba pwede? pwedeng-pwede – ako pa! Ebba…yup you can market your hair brush pang tusok! You can even make them in small, medium or large…the pins…now the material for the pako….maybe have it in stainless steel. Remember, it will tusok a food source…so aluminum not a good idea! Go to Home Depot or maybe any fabric store. it looks like crispy pata. im so excited when i saw your little section on pre-depature area in cebu airport and bought your signature lechon even my flight going back to manila was 2 hours delay and another 1 1/2 before i got my luggage in manila still manage to heat up the lechon and still taste good plus the complimentary bag of chicharon. wishing you of more success on your new venture and hopefully one of these days i can visit cebu again and eat at your restaurant. Hello marketman! I am an avid follower of your blog and have tried several of your dishes. My hubby and my son adores your “best adobo”. Sayang at super layo ng Cebu. Sana magkaroon na kayo ng branch dito sa Manila. Promise, unang una kami sa pila ng pamilya ko. Just an idea, why not set-up an eyeball on a regular basis on local airlines’ promo fare dates? That way, we could spend for a roundtrip airfare to Cebu without needing to stay for the night. Hmm…another biz idea. Tried it na last Thursday, ang SARAP ha!